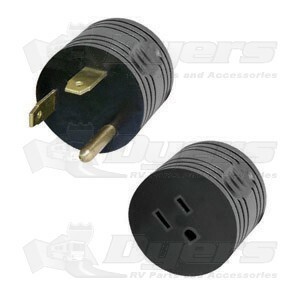 Adapter, used to plug a standard 15A/125V plug into a 30A/125V RV receptacle. 15A configuration: NEMA 5-15, 125V / 15A, 2-pole, 3-wire grounding. 30A configuration: 125V / 30A, RV use only, 2-pole, 3-wire grounding. Electrical rating: 125V / 15A / 1875W. Easy Grip Round Adapter fits Comfortably in Any Size Hand. 1-15/16" diameter, 1-9/16" thick without prongs x 2-7/16" with prongs.